Recently my mom and I had the pleasure of throwing a baby shower for our close friend Valerie. 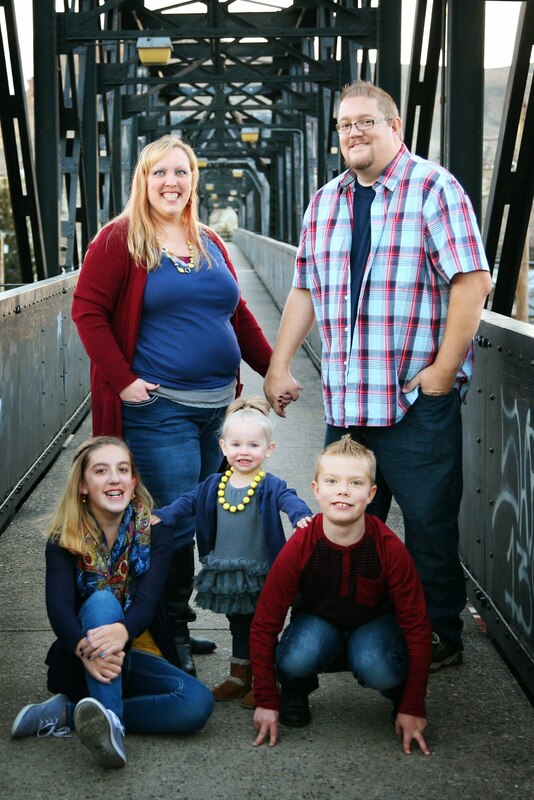 She was expecting her 3rd little boy (who has since arrived safe and sound, and adorable!!!) 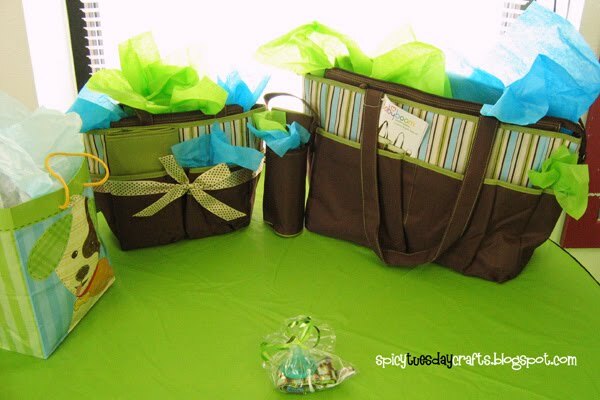 and she had most everything she really needed for the baby but I personally believe that every baby deserves a shower, no matter how many siblings he or she has, so we themed our party around restocking her diaper bag. They had no idea what to name this little guy, and no big plans for decorating his room, but Valerie wanted teal and green incorporated somehow . . . so we ran with it! I sewed the flag banners the day before the party using cloth fat quarters and bias tape. We held the party in the back room of our church (since most of the invitees attend there, we wanted a central location that was large enough for everyone . . . and the place was packed!) 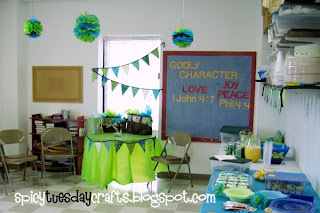 My mom made the blue and green puffs to hang from the ceiling and we tacked up the banners in different places. Valerie also has a deep love for argyle, so the invitations (oops, photo of those to come) were argyle paper diaper bags. And since it was a brunch party, we had fruit and juices and we made muffins and frosted them with cream cheese. 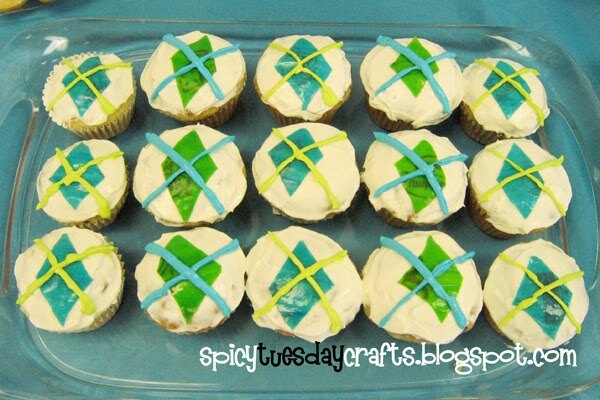 The diamonds are blue and green fruit roll ups cut up and the stripes were just more cream cheese dyed with neon food coloring. The invitations explained how this was a shower to restock the diaper bad and listed ideas of things to put in it. Mom and I picked out a diaper bag set for her and were able to find it in her colors . . . score! We were really happy with how the shower turned out! And I love the colors . . . I dreamed in teal and green for weeks afterwards! 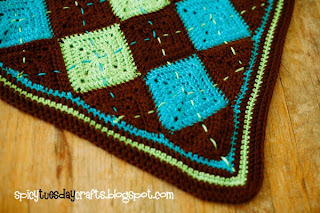 I love that the border looks like the bottom of an argyle sweater -- total accident! I think I'll write up what I did in pattern form and list it in my Etsy store . . . I can't be the only one out there who wanted to crochet an argyle blanket. Anyway, Valerie loved the blanket and took it to the hospital with her . . . and I got a txt picture of him wrapped up in it, which is the part of making blankets that I LOVE! 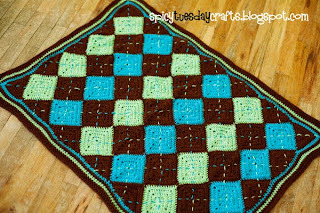 I'm also planing to make an argyle afghan for my little boy. And I'm annoyed that I can't find any nice patterns, to purchase or free! So I'm going to make my own pattern as well. Why do I always do this to myself? My plan is to fudge with a pinwheel/ granny square until I get the style right, that way the triangle/half-squares are already covered. 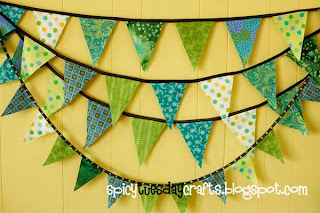 Also I hope to incorporate the thin lines in the pattern. Hopefully this works.